Exposure to the Sun is harmful to the Skin. Prolonged exposure causes Burning, Skin ageing, tanning, even Cancer. Always protect Skin using a high SPF Sunscreen, especially in tropical climates. A Tan, means that skin has been damaged, and is trying to protect itself by producing pigment cells (melanocytes) to absorb UV radiation. Sun damage not only causes imbalanced pigmentation, it causes damage to Collagen and Elastin, thus making skin to sag and lose its bounciness. Pigmentation, a more permanent ‘tan’ is Sun damage, spreading further as years of damage pile up. Along with it, Skin begins to look older than it is, causing fading of Skin color, giving uneven skin tone and hard to remove blemishes. 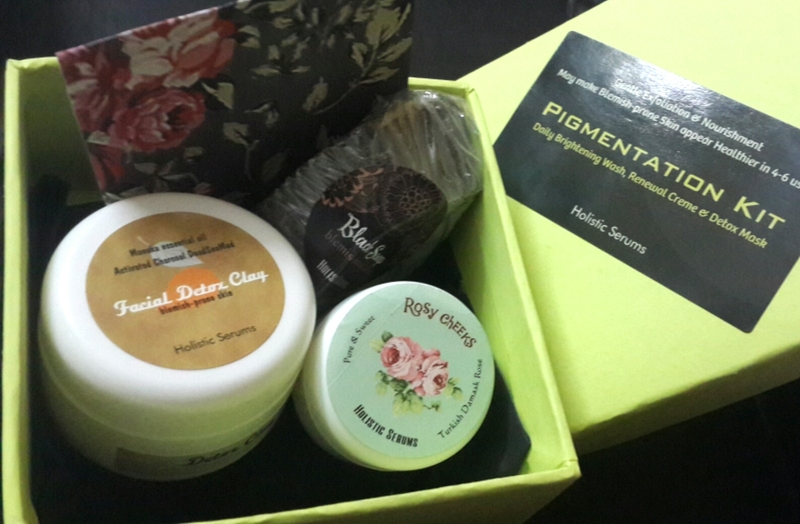 Pigmentation Kit consists of Skin Beneficial Nourishing Oils & Herbs to intensely nourish and keep skin healthy. Unlike our other Kits, this is a slow, gently nourishing process. Following a strict regime for the first 1-2 weeks is essential to jumpstart Skin health. 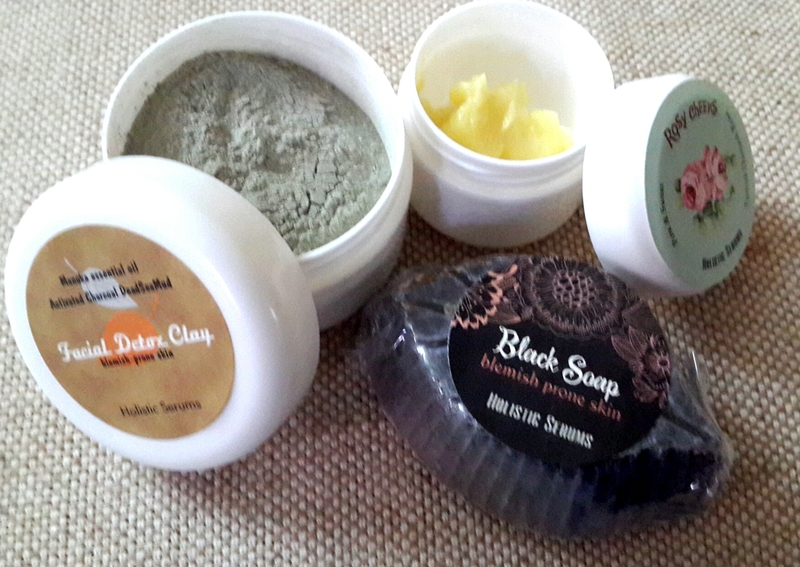 Black Soap combines a gentle Glycerin based soap with pure herbs and mineral-rich mud. Walnut hulls, Activated Charcoal & Dead Sea Mud go into this wonderful Soap which leaves blemish-prone Skin fresher, brighter and ready to take on the day. Well-suited for Mature Skin. 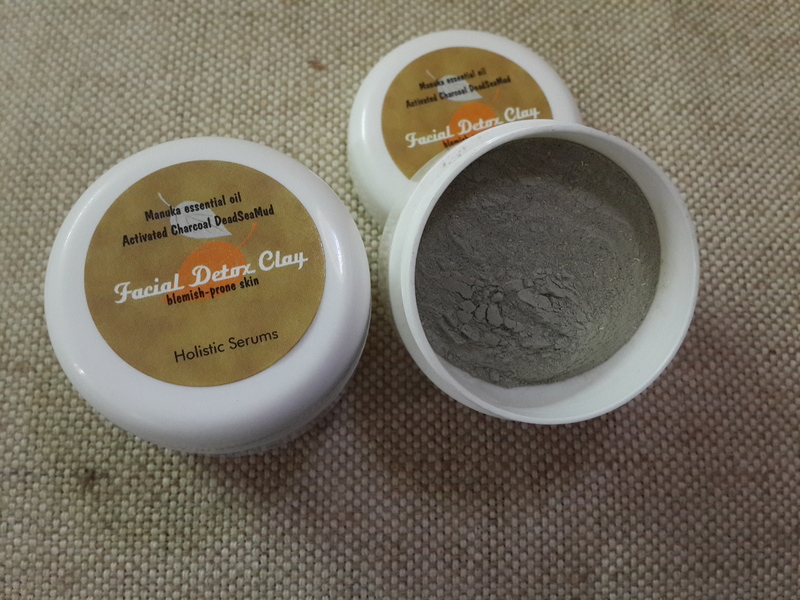 A pinch of Facial Detox Clay is mixed with a few drops of Detox Oil with Orange & Bergamot essential oils. Leave on for 5-10 minutes and wash off for smooth, cleaner skin. Use upto 7 times weekly. As this is a daily Mask, the addition of Skin oils, keeps skin soft, smooth and nourished. French Green Clay makes this a gentle Mask. The Kit contains Rosy Cheeks Renewal Cream with essential oils of Manuka, Seabuckthorn berry, both know for their Skin softening benefits in a 99% natural base of Beeswax, Apricot Kernel & Evening Primrose Oils. Enhanced with a touch of Turkish Rose Otto, one of the best oils for Skin since ancient times. all helping to give a youthful glow to Skin. Cream for Pigmentation, Rosy Cheeks, is enhanced with essential oils of Manuka & a touch of Turkish Rose Otto, one of the best Skin oils known since ancient times, to give a youthful glow to Skin. In 2-3 weeks, your skin will appear smoother and even-toned. Cleansing top layers of Skin with Black Soap, made with Walnut hulls and Dead Sea Mud to give energy to skin and brighten it. To intensify nourishment, Pure Rose Cream may be used overnight for Softer, Brighter skin each Morning. Anti-pollution Orchid Serum may be used in the morning. Read about the luxurious, ancient Egyptian Beauty Secret, Rose Oil and on the fantastic Orchid Extract known in TCM .